I’ve been obsessed with having a tiny camper since I was a teen. Shortly after college, in my first job, I’d drive back hills on the weekend looking for my camper. Fast forward 5 years, and a move to South Carolina. A friend had a Shasta and I loved the wings, the open feeling inside and I knew now was finally my time. I had found a Shasta Forum online. On there, was an old ad for just the camper I wanted, but it was marked sold. Oh well, I had a few questions to ask, so I called the number anyway. The guy said he had decided not to sell it, and I said “I SO don’t blame you- that’s so adorable- I wouldn’t be able to part with it either” as we talked, I told him I was going to name it the ‘Jenny Wren’ after a story a family friend wrote for my 1st. birthday, and because it would be my ‘nest’. He was quiet, and then shared ‘Jenny Wren’ was the name of his boat! After a little more conversation he said he’d sell me the camper….he knew it would have a good home with me. The happiest day was making a Paypal deposit, and getting up at 4 am to drive to Wilmington to bring her home! I don’t remember sleeping much the night before. Luckily for me, the camper was in great shape-the previous owner was willing to put on new tires and lube the bearings before we drove four hours home. The camper had the usual back quarter softness, but I’m fairly clever with wood and tools. There were times when I came back through the house, covered in sweat, saw dust and paint, to get yet another tool with a scowl on my face that my husband said ‘Remember….this is supposed to be fun”. 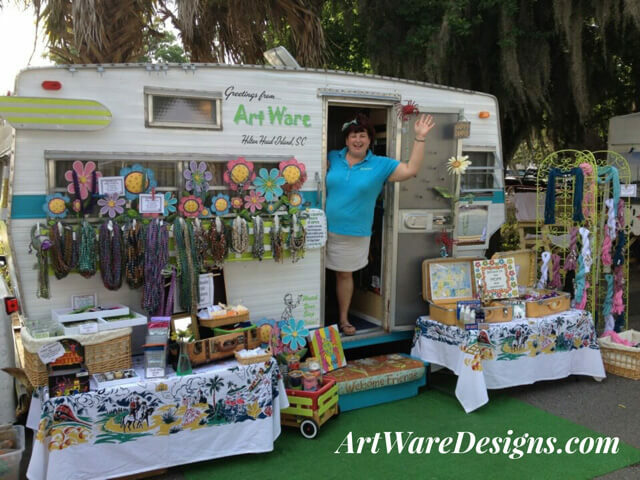 I knew from the beginning that I wanted ‘The Jenny Wren’ to be a rolling ‘pop-up-shop’ for our retail store on Hilton Head Island called ArtWare. 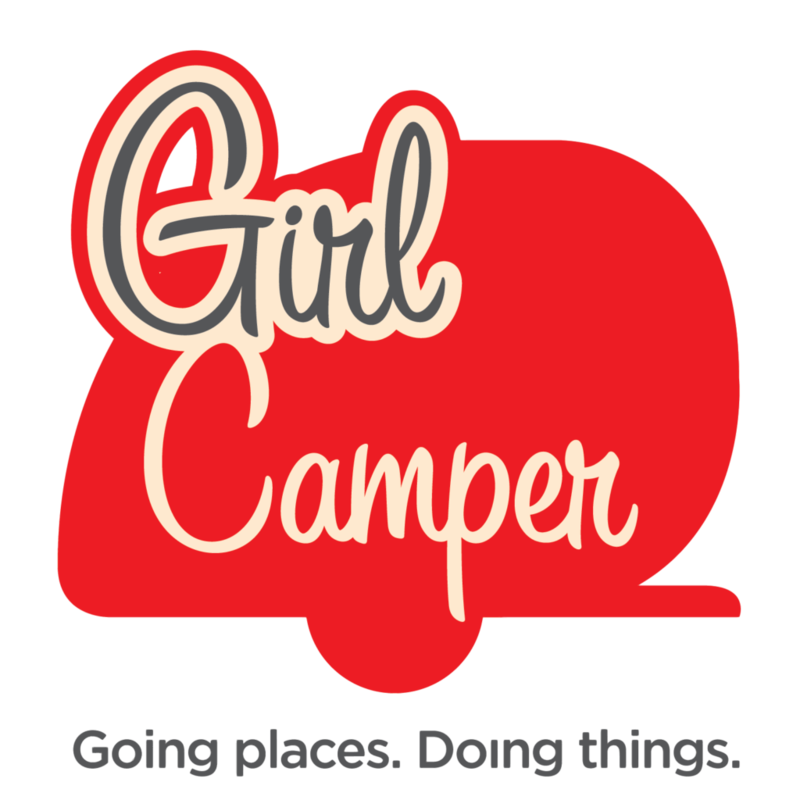 What could be better than having a camper, and getting to share it with people at regional art shows and festivals? I’ve been able to blend business and pleasure. We have a vibrant ‘Happy Camper’ area in our retail store with a it’s own mini camper. The LED campfire in front gets lots of attention, and smiles. Many customers share their camping memories with me. My decor started with the State towels by Cat Studio…I ordered 50 of them. and made curtains from them, arranging them with Northern States towards the front, East Coast States down the right, Southern states along the back in the order they cross the USA and up the left side with the West Coast states. Since the Jenny Wren is a bird, I tied in a migration theme…the bathroom is filled with birds. When you have a tiny camper, every little detail counts, so I painted the fuse box on the wall like a bird house, even fabricating a tin roof for the box. On the drawer fronts, I mod-podged vintage maps to the faces. My favorite elements are an over table light made from a globe, the reading sconces have shades made from laminated maps whip stitched with lanyards like Summer camp projects. The kitchen light is made from an old kitchen shredder. The skylight has a crystal chandelier framing the square. I love my quilt stitched with state birds and flowers. Even as I write this, I know I am rambling on- but these campers are just such fun, and individually expressive for each of us. The coolest thing that happened was, I could still read the name of the camper place in NH that sold the camper back in 1969. I called them, guessing they maybe happy to know one of their campers was still being enjoyed. The Grandson of the owner was so glad to hear, and said ‘Hey remember those metal wings they used to have on the back? I was up on the 6th. shelf cleaning the warehouse and found a wing, still in the box’. Unbelievable since I needed a wing for my left side! I got a wing for $50, 40 some years later, from the same dealership my camper came from. That’s SO cool! I have a really small house, and I really enjoy having my camper as a get away place in my back yard. I love to go out there and work on my website where it’s so quiet and peaceful, and I’m surrounded by things I’ve chosen to feather my nest with. On the lucky nights I get to go camping with my fellow ‘Sisters on the Fly’ or Southern Vintage Camper Friends, I love to enjoy the campfire, then come back to get under the covers and fall asleep in my own little space so content and heart happy sharing my love of camping with like minded friends.